What is the diameter of a circle with a circumference of ? To find the diameter we must understand the diameter in terms of circumference. The equation for the circumference of a circle is , where is the circumference and is the diameter. The circumference is equal to the diameter multiplied by . We can rearrange to solve for . All we have to do is plug in the circumference and divide by , and it will yield the diameter. The s cancel and the diameter is . If the area of a circle is four times larger than the circumference of that same circle, what is the diameter of the circle? Set the area of the circle equal to four times the circumference πr2 = 4(2πr). Cross out both π symbols and one r on each side leaves you with r = 4(2) so r = 8 and therefore d = 16. The perimeter of a circle is 36 π. What is the diameter of the circle? If the area of the circle touching the square in the picture above is , what is the closest value to the area of the square? Obtain the radius of the circle from the area. Split the square up into 4 triangles by connecting opposite corners. These triangles will have a right angle at the center of the square, formed by two radii of the circle, and two 45-degree angles at the square's corners. Because you have a 45-45-90 triangle, you can calculate the sides of the triangles to be , , and . 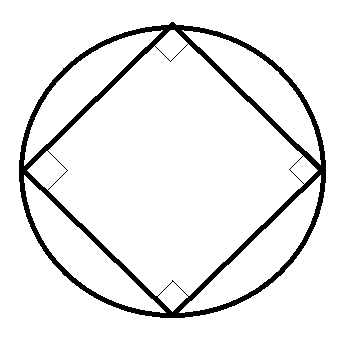 The radii of the circle (from the center to the corners of the square) will be 9. The hypotenuse (side of the square) must be . The area of the square is then . Two legs of a right triangle measure 3 and 4, respectively. What is the area of the circle that circumscribes the triangle? For the circle to contain all 3 vertices, the hypotenuse must be the diameter of the circle. The hypotenuse, and therefore the diameter, is 5, since this must be a 3-4-5 right triangle. The equation for the area of a circle is A = πr2. What is the ratio of the diameter of a circle to the circumference of the same circle? To find the ratio we must know the equation for the circumference of a circle. In this equation, is the circumference and is the diameter. Once we know the equation, we can solve for the ratio of the diameter to circumference by solving the equation for . We do this by dividing both sides by . Then we divide both sides by the circumference. We now know that the ratio of the diameter to circumference is equal to . What is the ratio of the diameter and circumference of a circle? Let represent the area of a circle and represent its circumference. Which of the following equations expresses in terms of ? What is the ratio of any circle's circumference to its radius?